My normal working day involves, in the main, being holed up at the laptop/phone in my ‘office’ (the living room; I’m a work-from-homer) for several hours, occasionally going out for meetings, shopping, whatever. The benefits of being freelance are vast but there are downsides…it can get pretty isolating and, working by yourself, it’s up to you to watch out for those times when confidence takes a dip, inspiration dissipates, or simply notice that you’ve not stepped outside for 48-hours straight and perhaps it would be wise to do something about it. Now happily I have a merry group of freelance pals who TOTALLY understand this. So chewing the fat with Kate this morning she mentioned that yesterday she made herself walk to the shop to buy some coriander and whipped up a proper soup for her lunch. And something in my brain went DING! YES! It’s too easy to just pick on leftovers from the fridge or, at a push, rely on toast and butter to get through the day. Not good. So today I whipped up my Melville Road Minestrone, so named because it relies on stuff that I always have hanging around the cupboards or the fridge, is super-tasty, really nourishing, and easy to knock together on a work-from-home day. I’ve made minestrone for years but this one is particularly good because it relies on fresh tomatoes rather than the more usual tinned; they bring a welcome freshness to the pot. Dice a shallot or small onion, one stick of celery and one carrot, and sweat them off in olive oil in a lidded pot along with a few finely sliced parsley stalks. When soft, add two finely chopped garlic cloves, 2 low-salt vegetable stock cubes and a squirt of tomato puree. Cook it together for a few minutes to take the bitterness out of the puree. In a food processor, whizz together five large ripe tomatoes, skins and all. Add this to the vegetables and top up with a cup or two of boiling water. Add a handful of macaroni. Season, pop the lid on, and leave to cook for ten minutes, stirring occasionally to dislodge the pasta that’s stuck to the bottom. Next, add a few finely sliced cavolo nero stems and a handful of chopped parsley. Cook for another five minutes, adjust the seasoning as you need then serve with grated parmesan. For a meaty option, add some pancetta to the soffritto mix at the start, and a few cannellini or borlotti beans would also be fine additions. Fresh pesto dolloped on the top could replace the parmesan…the options are endless. It’s not the prettiest of soups but who cares? This is a good nourishing lunch for all the work-from-homers out there. 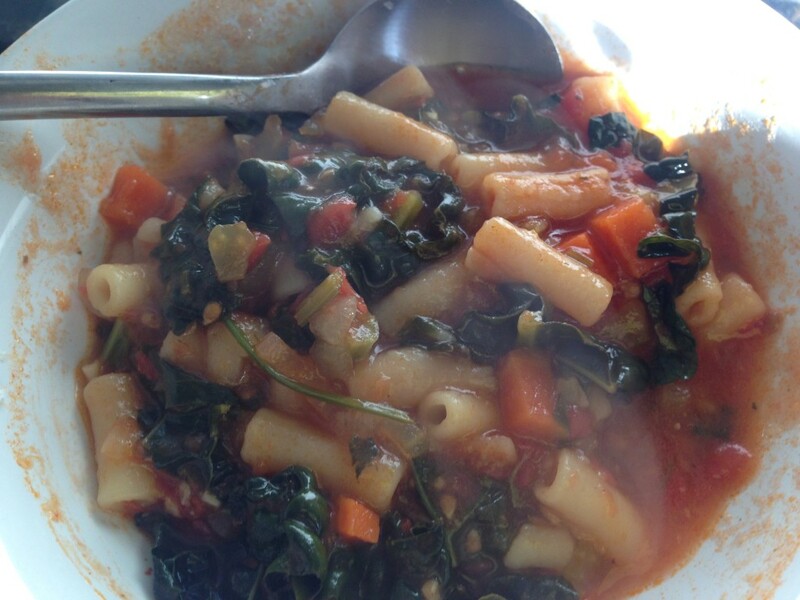 This entry was posted in Recipes, Savoury and tagged minestrone, soup. Bookmark the permalink.